The one thing to remember about an adventure is that if it turns out the way you expect it to, it has not been an adventure at all . . . Shanghai, 1925. Irene, a museum curator (and, unoffically, a treasure hunter) is searching for a set of legendary copper scrolls which describe the forgotten history of Cambodia's ancient Khmer civilisation. 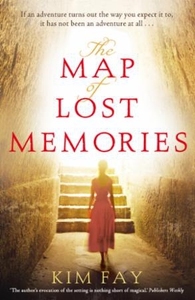 Her mentor has sent her to China to enlist the help of Simone, a mercurial Frenchwoman who - along with her notoriously violent husband, 'the most dangerous man in the Orient' - has a reputation for both stealing artefacts and starting revolutions. Irene and Simone set off through the Cambodian jungle to search for the scrolls, but it soon becomes clear that each is determined to acquire them for her own reasons, and that once they have located them it will be every woman for herself . . . Gripping, evocative, lavish and thrilling, this is an unforgettable book that was listed as one of Amazon's top 100 Breakthrough Novels before it was even finished.